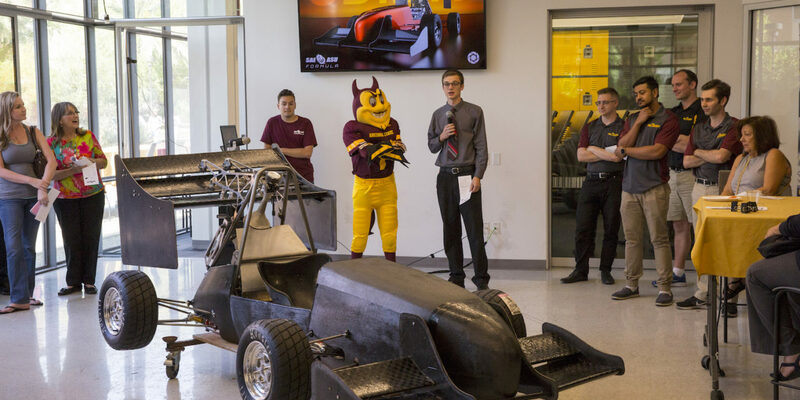 A confident Arizona State University team is gearing up for what is widely considered the toughest international student automotive design and performance competition. 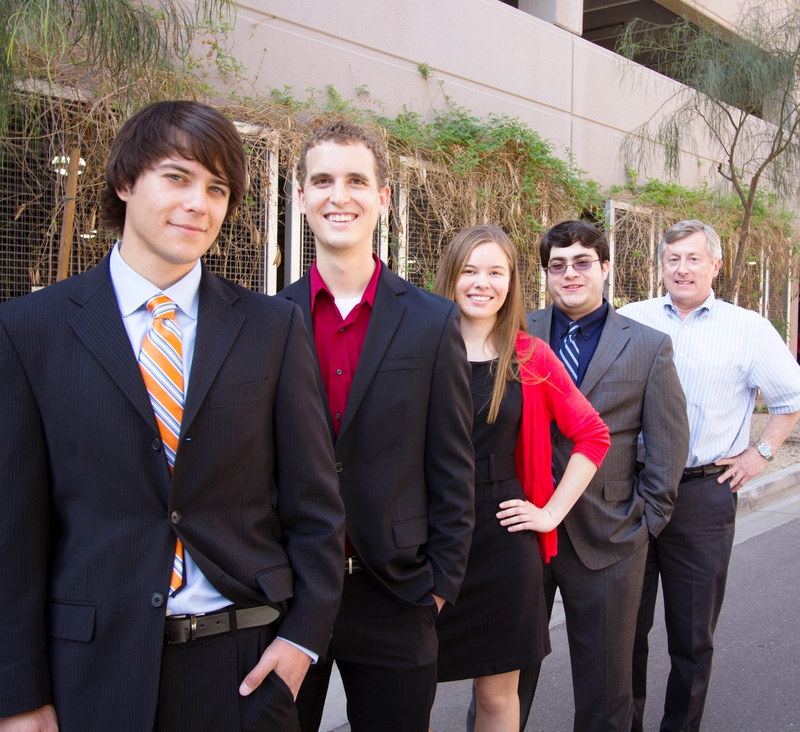 About 30 members of ASU’s chapter of the Society of Automotive Engineers are planning to make the trip to Lincoln, Nebraska for the 2017 Formula SAE event June 21 to 24. 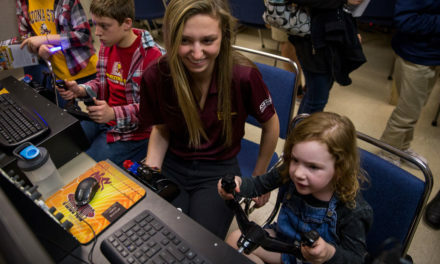 Those students are about half the number of the chapter’s members who have been working for much of the past year on the race car that will get put to the test against about 80 other teams from colleges and universities throughout the United States and several other countries. 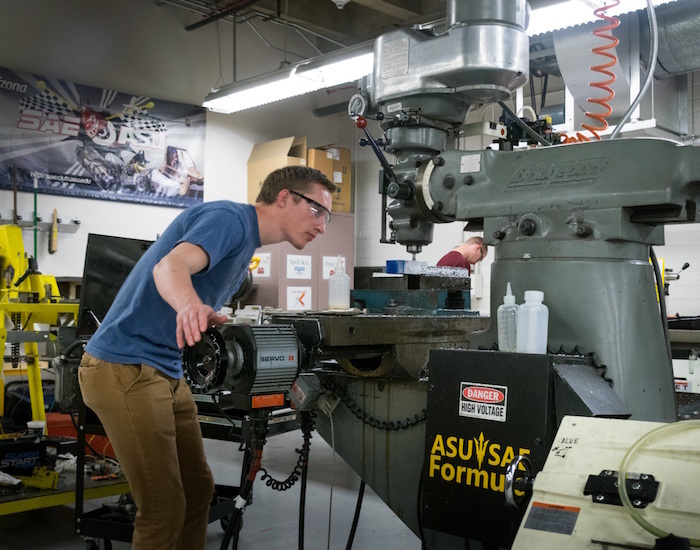 “We have been designing, engineering and building almost nonstop since last June,” says Troy Buhr, the Formula SAE team captain who graduated this spring with a mechanical engineering degree from ASU’s Ira A. Fulton Schools of Engineering. “We’ve had workshop days just about every Saturday, and in the past two months we have been in the shop almost every day,” he says. 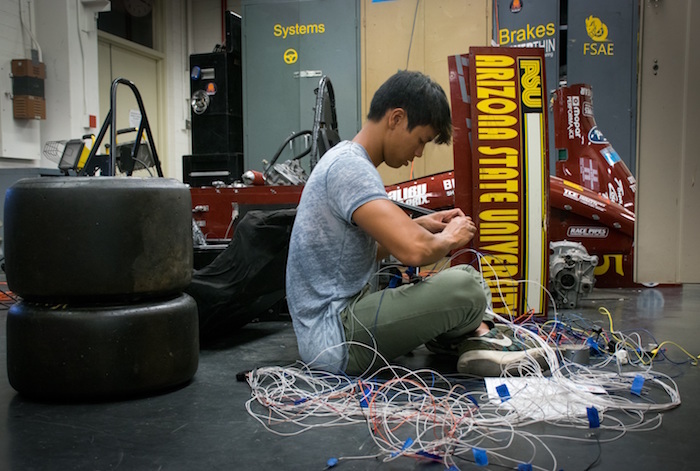 What the sustained effort has wrought is stoking Buhr’s optimism about the team’s prospects for success at the Formula SAE competition. He notes that this is the third straight year the SAE chapter has produced a brand-new race car from start to finish — the first time that’s been done by the student organization. 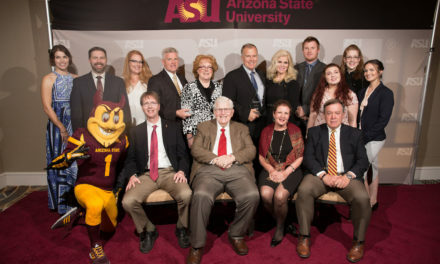 The trend had been for the ASU teams to build a new car about every five years. So designing and assembling new cars in three consecutive years “is a huge accomplishment because it shows we are building a strong foundation of teamwork and using the new knowledge we’ve gained year to year,” Buhr says. Equally as significant, the 2017 car is the first in the chapter’s more than 25-year history to have a full package of aerodynamic features, highlighted by front and rear wings on the vehicle. The new race car also sports 10-inch wheels instead of the 13-inch wheels used in years past. The new wheels, along with a decrease in the size and weight of other components, should enable the vehicle to perform more efficiently. At the competition, cars are evaluated through highly detailed technical inspections and cost analysis. Teams must submit an in-depth evaluation of the fundamental engineering principles that guided the design and building of the car. There’s also a sales presentation that requires teams to make the business case for how mass production of their vehicle could be a profitable venture. On the track, cars are judged on their proficiency in acceleration, braking, general driving stability, overall efficiency and endurance. They must be driven on an autocross run, a timed competition requiring drivers to navigate a track designed to test the vehicle’s responsiveness and road-handling capabilities. 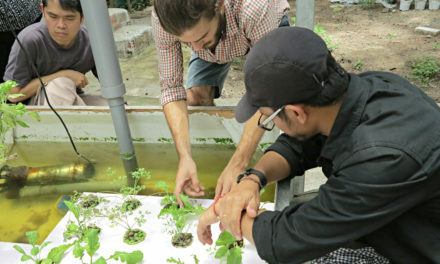 “The idea is to test every aspect of a team’s engineering and teamwork skills,” Buhr says. Just getting into the competition requires at a test of the team’s fundraising skills. The cost of producing the race car amounted to about $30,000, and then there was the $2,250 registration fee to enter the Formula SAE event. To cover costs, the team launched a crowdfunding campaign and secured industry sponsorship and other support from dozens of companies, including Ford, AEI Fabrication, Industrial Metal Supply, Solidworks and PPE Engineering. The project management, collaborative labor, financing and other aspects of the endeavor “are training our members for work in industry,” says Buhr, who will soon begin a job with Ford Motor Company in Michigan. Tichy notes that the team’s crowdfunding effort was aided this year by members who are pursuing degrees in business and communications fields. They helped with advertising for the fundraising campaign. The team is looking to add journalism and art students in the near future to benefit from their particular skills, he says. “Above all else, our primary goal is to develop the technical, professional and communication skills of our members,” Buhr explains. Right up at number two on the SAE chapter’s list of goals this year is boosting the team’s reputation among its peers by placing within the top 25 among the formidable contenders it will face at the upcoming Formula SAE competition.